Join us for events and classes. Check back as this space is updated frequently! Whether your partner is currently expecting, you are a new parent, or a seasoned one, we welcome you. 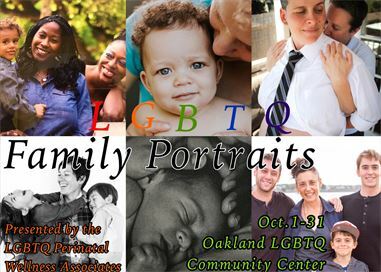 This is your space to bond with other non-birth parents whether you are seeking support, or just looking for community, friendship, or a simply a night that's about you. We're seeking essays for the forthcoming anthology. For submission guidelines please email us. Gorgeous day at the FunRun & Wellness Expo celebrating Oakland Pride!! So many thanks to you Kin Folkz- Spectrum Queer Media- and to Heaven Walker, Kathleen Scheible, Tanya Stiller, and Akasha Madron of the LGBTQ Perinatal Wellness Center for sharing your love and expertise at our booth today! !